Cuba Writers Program 2017: Applications Open! 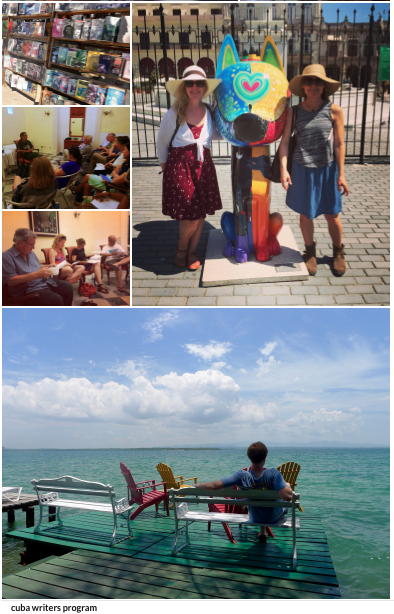 Applications are open for the second Cuba Writers Program, this April 27-May 5! The Cuba Writers Program offers a writers writing in English an 8-day journey to Cuba in the spring of 2017. The program combines writing workshops with ethical travel, conversations with Cuban writers, lectures on the history of Cuba and elements of its literary history, and visits to art collections, paladares, Hemingway’s home, and sites of political, aesthetic, and historical interest. The Cuba Writers Program was founded by Tim Weed and Alden Jones, two writers who first worked together teaching creative writing and directing a program for American students in Cuba in 2001. Both Tim and Alden have have continued to travel to Cuba and to direct programs in Cuba over the past sixteen years. They are excited to share some of their contacts, out-of-the-ordinary knowledge, and travel experience with an intimate group of writers and travelers.